(above) Thomas F. Brittain, whose career with the Garwood Fire Department spanned over 50 years, nearly 35 of which as Chief. 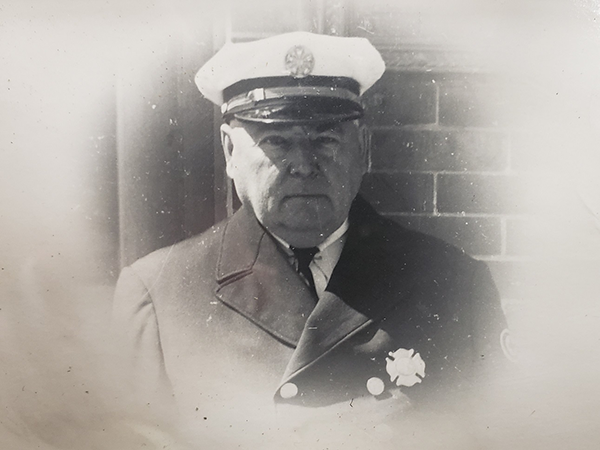 Garwood Historical Committee’s Spotlight on Fire Chief Thomas Brittain, Sr. The next time you’re in the Borough’s fire station take a look in the long glass case along the wall and amongst the memorabilia you might notice an innocuous-looking set of items. Next to the old toy fire trucks, helmets and hoses is a portrait of a former fire chief and a few lines about his service. Thomas F. Brittain, born October 1887, moved from Newark with his family around the turn of the century to Winslow Place in Garwood. His father, Edward Sr., took a job at the Hall Signal Company Factory, where the Crunch Gym currently sits, and Thomas would become a fireman in 1911. By 1922 he was named Commissioner of our burgeoning town’s fire department and not seven years later he would be made Chief. During the Second World War, Chief Brittain would be on the Borough’s Defense Council, helping train neighbors to be reserve firemen. He helped ensure higher pay for his firemen, oversaw the department’s purchase of its first fire truck, doubled its size and would remain Chief until his death in 1961. His career spanned over 50 years, nearly 35 of which as Chief. He also had two younger brothers serve in the department, served as a councilman and also as the President of the Board of Trustees of the Garwood First Aid Squad in the 1950s. Our historical committee thanks the Brittain family for their selfless volunteer services to our great Borough.